To a migrant raptor like the golden eagle, Aquila chrysaetos, energy conservation is as important as it is to us. If eagles are too tired after arrival, then egg-laying or food gathering is going to be limited, if not cancelled. To minimise energy use during travel it is necessary to use winds, thermals and behavioural strategies for least exertion. There is a spring migration though the Appalachian Mountains that can test these strategies in the animal. Ten eagles were fitted with GPS-GSM units weighing 95g (against the 3370g to 5120g of the birds). Data was collected at 30 to 60 second intervals, except when there was no movement, in which case the GPS switched to a 15 minute-interval collection mode. The birds took just over 5 days to cover the 333km area of the experiment providing on average 51 data points per hour. Thermal soaring and response to winds were successfully recorded on a very fine scale. By the end of a year's experimentation, it was established that the birds had a stereotype of reacting to high wind speed by changing from thermal to orographic (based on mountain relief) flight. They used available lift at all times but the high resolution data available only from GPS telemetry indicated several undiscovered facts. Their flight patterns, for example remained constant throughout the year, unlike some observations that infer otherwise. They also surprised Michael J. Lanzone et al by increasing speed on descents and ascending more slowly than expected. The group of raptor scientists, mainly based in West Virginia, and Pennsylvania in the US and Quebec in Canada publish their research paper today in the Royal Society journal Biology Letters. 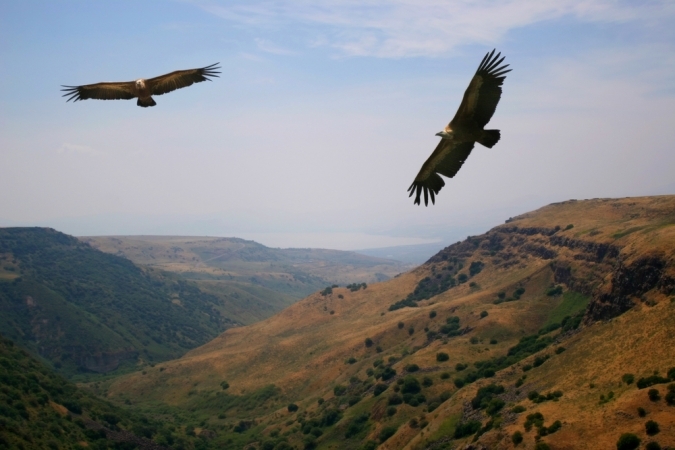 As increased wind speed causes golden eagles to decrease their vertical air space, it could be argued that industrial scale wind farms on ridges are a great danger to migrating raptors as they descend. However the standardisation of their behaviour does make it easier to predict when and where they are flying. Eagle safe avenues or operational mitigation at wind farms are perhaps "flights of fancy," But it seems likely that something of this order could be feasible and implemented without any great cost to industry or to the eagles. It's a test of society whether we can manage such implementation and integrate with our local ecologies. The alternative would be standing alone on a barren earth.